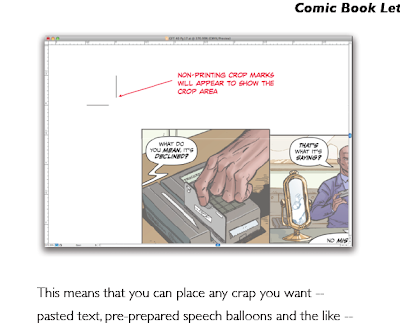 I've managed to find very few resources online that help with such tasks, so my friend Brant Fowler pointed me to a PDF file that should serve as a decent source for any would-be letterer. 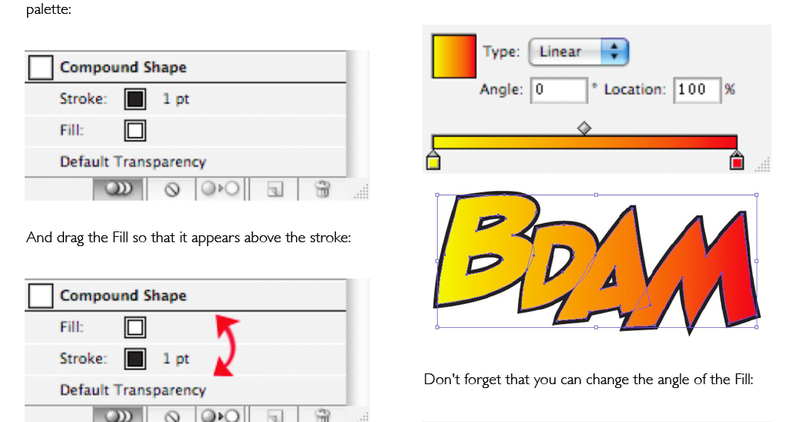 It's A Guide to Comic Book Lettering with Adobe Illustrator by Jim Campbell, and you can download it here. The guide goes over a number of common and not-so-common lettering techniques, some of which are different than what I use currently, some of which I've never had explained to me before. 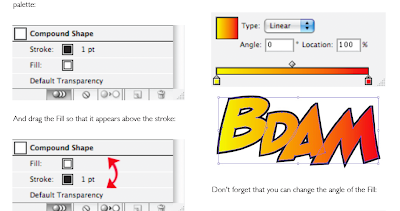 Campbell's guide is made for Illustrator CS3; I use CS4, so there are some differences (Adobe recently came out with CS5, so the information is somewhat dated in some cases, though it's mostly still accurate). In any case, this is a handy (and free) guide that I'd recommend that any comic letterer check out. It's not a comprehensive guide and, as I said, there are some techniques that I do differently (mostly different ways to solve the same problems), but there are things that this guide points out that I've never read before, as because of that, it's a great resource to have around. Check it out! Here's a direct link: https://files.me.com/jim.campbell/qqt5ck. It's time for some more great Thing sketches (and so-so commentary), including my first sketch with color (woo! 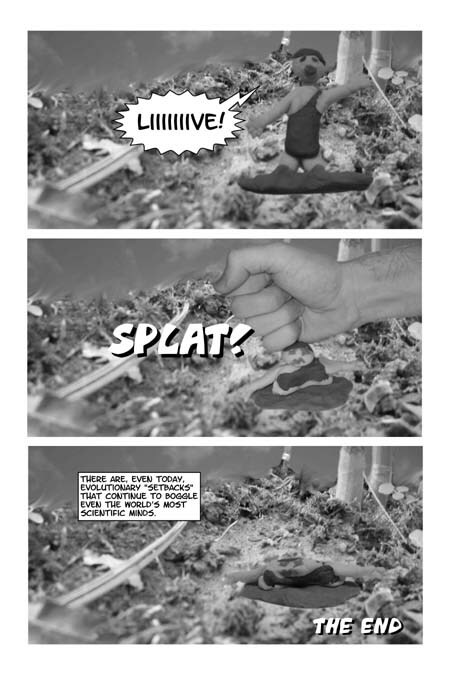 ), courtesy of...well, me. We're not quite half way through the sketchbook at this point, and I hope to add a couple more in the next few weeks. Hope you like! Amanda Conner is great a drawing expressive faces, and this is a good example. Before adding in the speech balloon, she asked "what is the Thing's catch phrase again?" C'mon, Conner! My friend Ruben drew this for me as we were waiting to see the midnight showing of Batman Begins in a theater in the middle of New York City. I think he stopped drawing because the lights went down. I've known Ryan for a number of years, but we first met (outside of the Internets) at the big San Diego Show in 2006, where he drew this Kingpin-esque Thing for me. The red shading is particularly nice. This inker (whose name, other than "Dez", I unfortunately forget) stopped by the booth I had at the San Diego show in 2006. At the time he mentioned being one of the dozens of inkers working on "Infinite Crisis". Andrew Foley and Fiona Staples were at the Markosia booth promoting their vampire comic "Done to Death", and Ryan Stegman passed the sketchbook on to them after he finished with his entry. 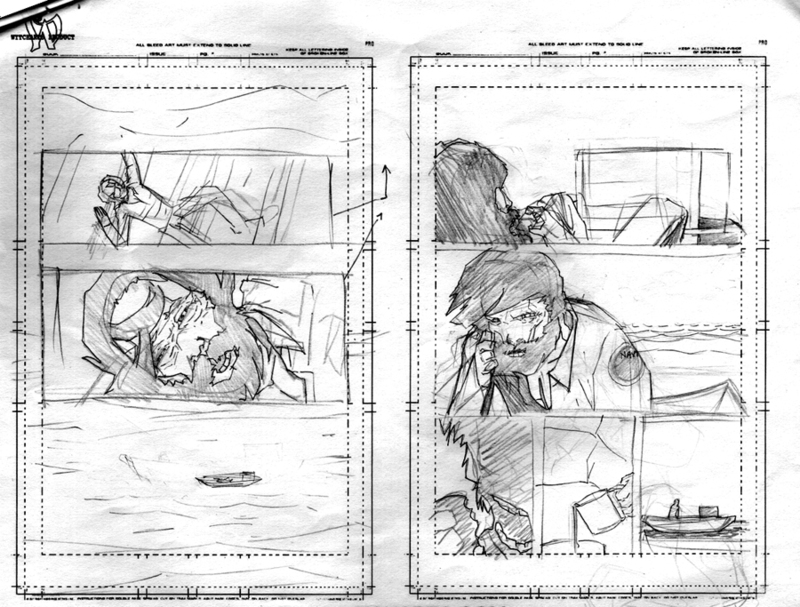 Some great sketches. More to come! 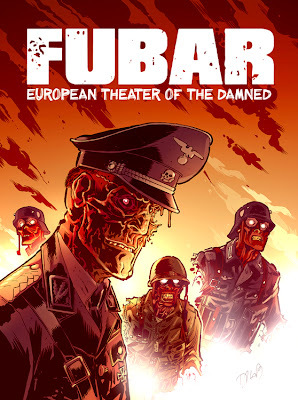 I mentioned some time ago that the WWII zombie epic FUBAR had sold well enough to warrant a second printing: the image you see above is the cover to that print, which will be available to order soon. 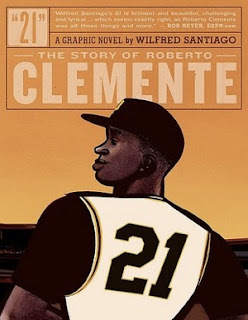 This cover is by the great Danilo Beyruth, whose website (with tons of great art) can be found here. It's easy to see that he nailed the image. If I were in charge of such things (I'm not), I'd have this piece be the first of three interlocking covers, one for each planned volume. Heck, I'd chip in some money to make that happen if it were a possibility (hint hint!). Speaking of further volumes of the book, below is an ad from Jeff McComsey for this fall's volume 2 release. 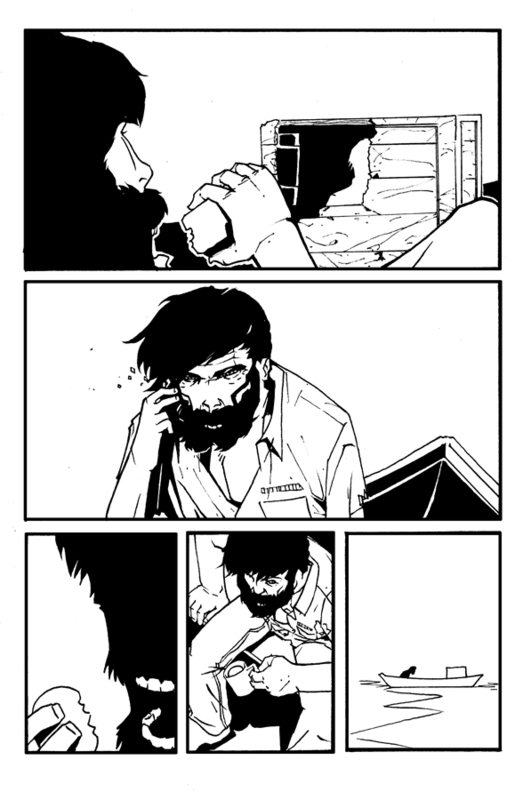 I'll have some more work in this book, and as I posted about recently, it's looking good. I've still got some copies of the first print to take with me to next month's Motor City Comic Con, so if you're going to be attending that show, be sure to check it out! Since that print run is basically sold out, perhaps you could buy it and then turn it around for...100 times the cover price. Perhaps. Desperate plea to Barry Windsor-Smith: Please finish your Thing graphic novel. I'M BEGGING. A few years ago I read an article on Newsarama that described Barry Windsor-Smith's progress on an original graphic novel starring the Thing. Windsor-Smith, who might be best known for his work on the Conan the Barbarian title, had started working on the Thing project once again after a period of stagnation. As I read the article (which has since been lost to time, apparently), it explained that BWS had been working on this particular project since 1985, and it cautioned that there wasn't any great anticipation that the graphic novel would be out on the shelves any time soon. This portent appears to have been true, as there isn't any further news on this Thing story in the five years since I read that Newsarama article. Other than some very enticing preview art and a synopsis from Windsor-Smith himself, this book seems to once again be in limbo. Now, it's important to understand that BWS will certainly work on this at his own pace, and I don't by any means feel that he owes us this book. If he finishes it, then he will. If he doesn't, then either someone else will or the book will never see print. That being said, I WANT TO READ THIS BOOK SO BADLY! On the off chance that Mr. Windsor-Smith comes across this post and takes the time to read my thoughts, let me say just this: this is a project that I very much want to pay large amounts of money to own a copy of, and I'm certain that there are others who feel the same way. I'm sure that BWS has his own personal reasons for completing or not completing this story, and those reasons will win out over all others, but I continue to hold out hope, 26 years since its inception, that eventually this will see the light of day. 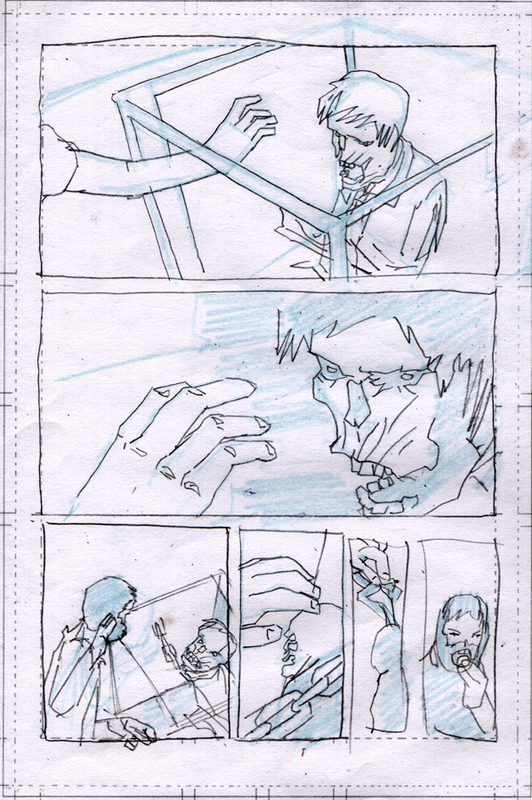 There is hardly any comic-book type action in my story. 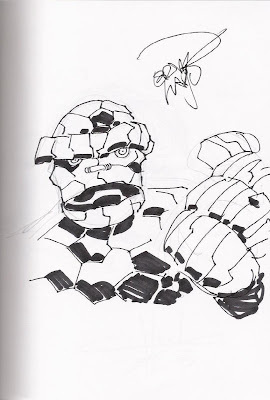 Ben Grimm is showing signs of what the psychiatric field terms dissociation (opposite of association: in the hip meaning of having things -- one's self -- together. Dissociation is the opposite: of losing one's sense of self). While Ben Grimm has come to terms with his man/monster public image, his inner self is deeply disturbed. Due to this, and over time, Ben has become susceptible to intense neurosis. 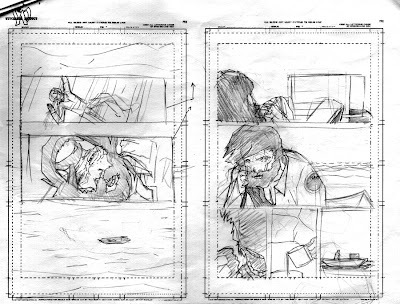 Ben's shattered self-regard is depicted in the two-page nightmare montages that open each story. In these scenes we see Ben literally falling apart as he pleads with the members of the FF (and his lady friend Alicia Masters) to show compassion for him. In the first story, as Reed and Sue and Johnny are about to take summer vacations, Ben receives a letter from a Madison Avenue talent agency offering to represent him in the lucrative field of celebrity commercial endorsement. This otherwise anomalous solicitation is the springboard for the entire story. After his fellow Fantastics depart on their vacations, Ben is left alone in the city, dealing with his discontent and his loneliness. After a calamitous water-borne emergency and much misguided rumination, he decides to quit the superhero game and the FF in particular to turn his "inimitable charisma" to show business. Despite the gravity of a plot describing Ben Grimm's psychological unravelling, this story is told as a comedy. 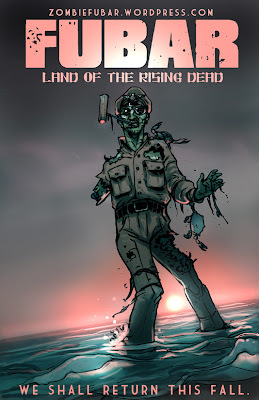 My concept for publication is to present the work in a single volume (HC and TPB) with editorial material explaining the history of the story and including the many visual out-takes culled from over the years. This will not only be rewarding in an historical way but will allow a smoother transition from the look and sound of my 1980s work to my somewhat-different style of 2005. Ooh, I so much want this to become a reality. Maybe one day. I can't say for certain, but I believe that FUBAR: Volume 2 is set to come out this fall, and it'll be a bigger collection than the first. 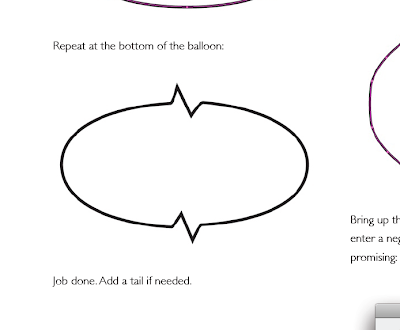 This is a fun project that will hopefully spread out into a third volume (one step at a time, I know). 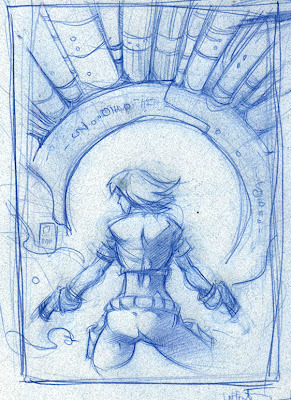 Once I know more about this and get new art, I'll post it up for all to see...and enjoy. Yes. Primordial Soup, uh..."webcomic"? with Mike Harvey, plus "Weird Al" Yankovic's new song! 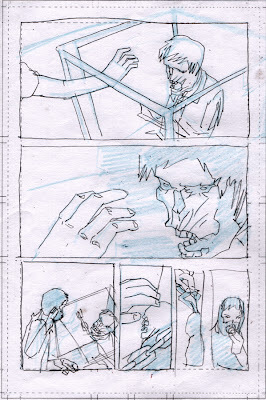 Several years ago, soon after "Eye of the Beholder" was published in Strip Search, I took stock of my comic book aspirations and realized that beyond writing half-developed scripts I had NO clue as to the process that went on to put a comic together. 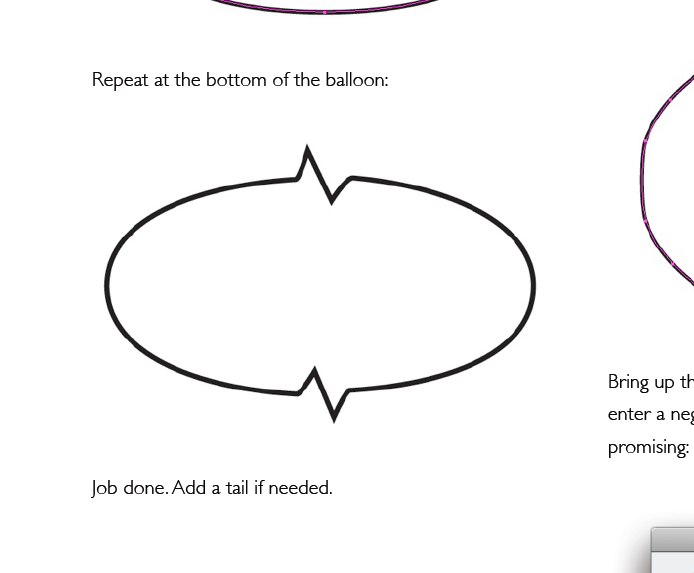 Beyond this, I had no idea how I would ever again convince an artist to work with me on one of those half-developed ideas (some things never change, I suppose). 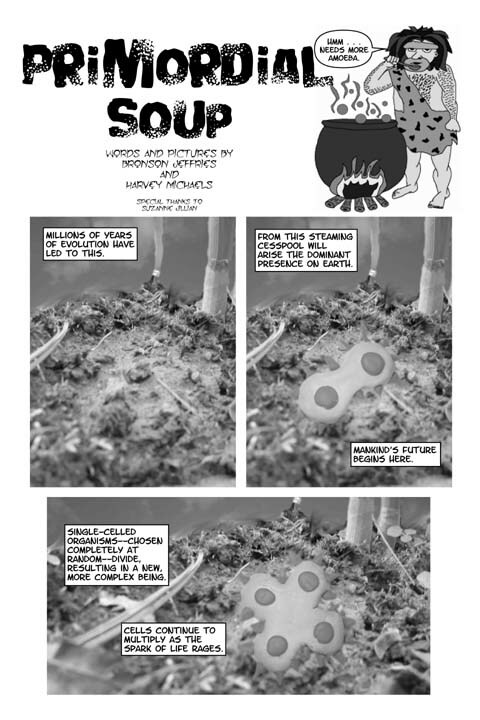 In a (perhaps rare) moment of proactivity, I decided to figure it out by putting a short comic together, and I was helped by my friend Mike Harvey, who just so happened to be one of the only people I knew with a digital camera. The result is as you see below: despite our low level of sophistication, and despite the fact that we decided to go with extremely clever pseudonyms rather than give our actual names, I think that the two of us put a fun short story together. It's not earth-shattering or anything like that, but hey, it was fun. The one constant background was just a close up of a section of my back yard juxtaposed with a shot of the sky (the volcano looking image is just a plant...it's a happy coincidence that it turned out as well as it did). 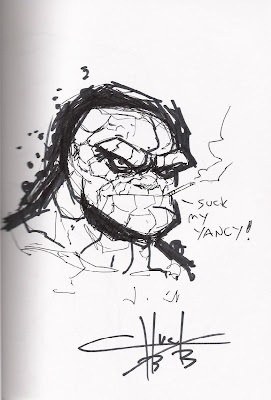 Mike himself drew the caveman that serves as possibly the best joke of the story. 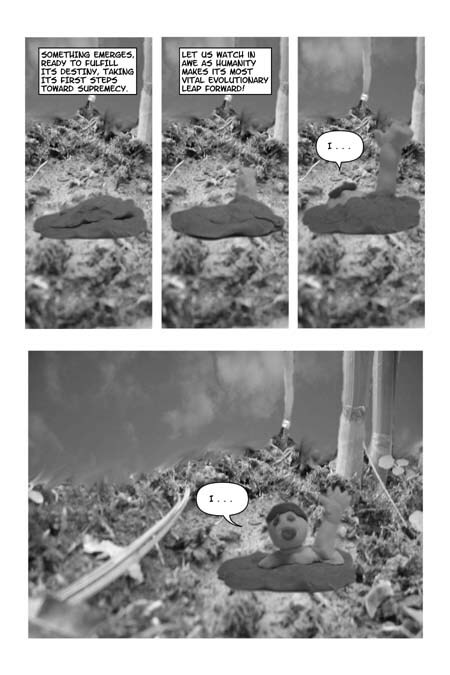 The dividing cells and the Mr. Bill-esque character were...I don't know, Play-Doh? My sister helped with creating that little guy, hence the "special thanks" credit. And the relatively giant godlike hand...is mine. Mike and I took a short drive to my college's computer lab, which had a number of Macs with editing software loaded on 'em. We downloaded some generic Blambot fonts and even some template speech balloons, which look better than some of the balloons I make now that I know how to do them myself. All in all, not bad for something that was cobbled together with little or no experience. Check it out! Mike recently painted a Mini-Marvel style rendition of the Yeti that you can see here. Also, "Weird Al" Yankovic has a new song, "I Perform This Way"! This has nothing to do with the above post. I just love Weird Al and this new song means that a new album will be on the way soon. Al has a blog that he updates every once in a while, and if you want to read about this new song and why it almost didn't get released, you can find that here. Listen to the song on below. Wagon Wheel Comics at the Motor City Comic Con! I took a cursory glance at the website for Detroit's Motor City Comic Con yesterday and saw that, hey, apparently I'm going to be there this May! I applied a while ago but hadn't heard anything from the show organizers since, but seeing my name on the "guest" list clears things up a bit. I even made the front page, which is either a signal of my rising star in comic fandom or a sign that bigger talent that will push my listing to the back is still yet to be announced. Take a peek! Ooh, hey, Tim Sale and James Robinson and Tony Harris! 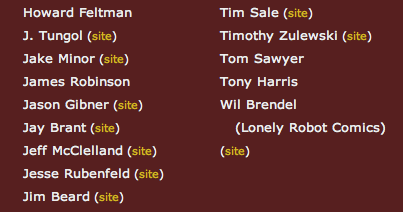 Plus some people from Star Trek and Battlestar Galactica! Cool. I should have more information soon on things like a booth number and the floor plan, but for now it's just good to get confirmation that this will actually be happening. I was rather halfheartedly scrolling through Diamond's preview of upcoming Marvel books a week or so ago when I literally - and by "literally" I mean I actually did it - did a double take, passing up then quickly returning to the solicitation for the title "15 Love" by Andi Watson and Tommy Ohtsuka. The reason I was so surprised to see this title was because I vaguely remembered it from, oh, eight years ago or so, back when Marvel was putting together their ill-fated Epic line. At the time this title seemed a bit out of place, for obvious reasons, and years later it seems no less odd at a company like Marvel. I can only wonder why exactly the folks at the big M decided to publish this story after letting it sit for nearly a decade. This July, get ready to say game, set, match for 15 Love #1 (of 3) – a never before seen, giant-size story from acclaimed writer Andi Watson (Skeleton Key, Buffy the Vampire Slayer) and artist Tommy Ohtsuka! Mill Collins is about to learn that life is anything but a piece of cake when the length of your high school career depends on the strength of your serve! But when Mill’s slipping grades threaten to steal away her scholarship from the exclusive Wayde Tennis Academy, she’ll have to look for help from the most unlikely coach to climb her way back up the bracket and into the record books! You'll notice that both are sports comics and both, interestingly enough, have titles that start with numbers. But I think I'd rather get punched than read "15 Love". Two sides of the same coin, I guess. 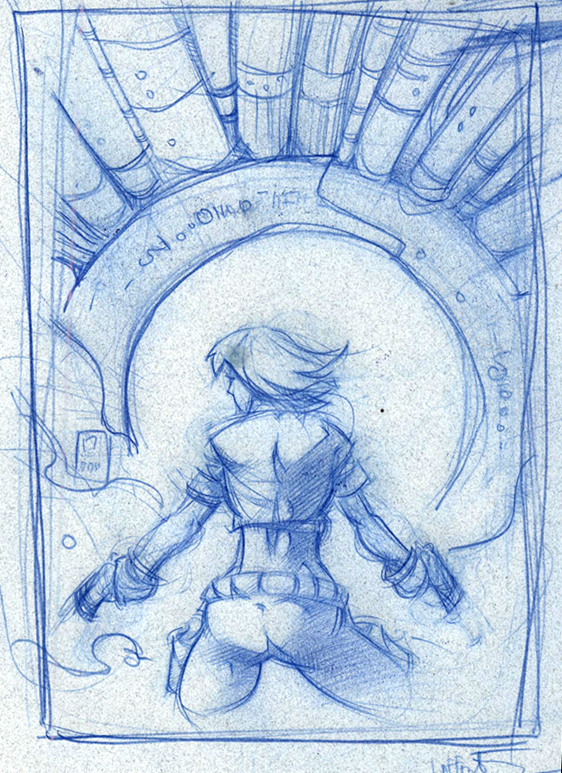 It's time for more Thing sketches...because I said so. I did! I just said it. This is a fantastic bunch, with what might just be my favorite related story. I imagine which one I mean will be obvious. Take a look! 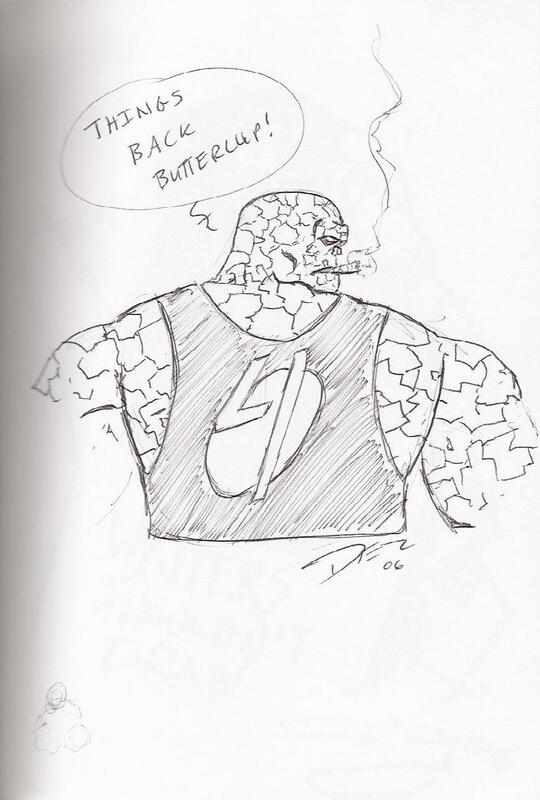 This is apparently Erik Larsen's stock Thing image, as people have told me they've seen it before when they look at the book. It's fantastic either way. 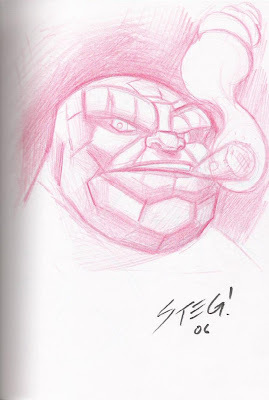 Most people draw the Thing smoking a cigar, which was the norm in the 1960s and '70s. A cigarette doesn't really have the same effect. This was the most awkward sketch in the book. Talent Caldwell had a sign on his table that read "I will not sketch Supergirl." I asked him why, and he said "because I hate drawing Supergirl." I gave him my book and he made it look like it was the most painful thing he'd ever done. He stopped several times and shook his hand like it was cramped (who knows, maybe it was) and would make "aagh" noises under his breath. To break the silence of me just standing over him watching him draw, I said "your art reminds me a lot of Michael Turner's", at which he took offense. He said "it doesn't look anything like his! ", but here's the thing: he studied under Turner, worked in his studio, and would do backgrounds for him. Anyone who's seen their art side by side has to admit that there's at least a resemblance. But he would have none of it. As he was drawing, a handful of people gathered around, each getting his or her sketchbook out in anticipation. When he was done, I took the book back from Talent back and thanked him. He shouted out "twenty dollars!! 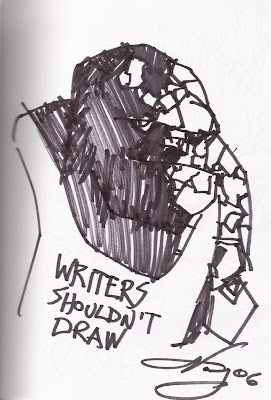 ", at which point, everyone else put their sketchbooks away. I handed him the Andrew Jackson (or the equivalent thereof) and he said "I probably should have told you that before I started drawing." Also, a friend of mine was with me in line, and after a while he started recounting a story told earlier about Caldwell by Jimmy Palmiotti and Amanda Conner. Apparently they had all gone out the night before and had some drinks, so Jimmy and Amanda started referring to him as "Wasted Talent", etc. My friend started to recall this and was being WAY too loud about some of the nicknames, which Caldwell obviously heard and, as he was uncomfortable with it, started shifting listlessly in his seat as he was drawing. I had no idea what to do while all this was going on, so I just stared at the ceiling. Darryl Banks might be best known for co-creating the Kyle Rayner version of Green Lantern. 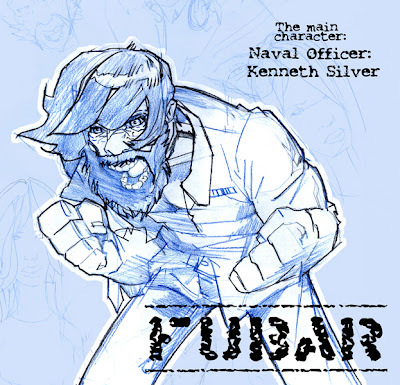 In 2005 he had been out of comics for a little while, but was looking to break back in with a Cloak and Dagger pitch. The writer at the table with him wanted everyone to sign a petition to send to Marvel saying that they should be allowed to produce the book (which seemed like an odd way to go about things). The writer went into his pitch on what he would do with the characters. "Most people don't know how to write teenagers," he said, "but I do!! I've lived it!" He was very adamant about that fact. I asked Darryl why he incorporated the dollar sign into his signature, as he had started doing about half way into his Green Lantern run. "It's when I starting making lots of money", he said. How does someone get a name like Casey Jones? In any case, he's one of the nicest creators I've met, and draws the Thing with two eyebrows as opposed to the Kirby-esque unibrow. He drew a couple fill in issues of the FF in '04 or '05, and I've since become a big fan. Magic Bullet #2 is in! 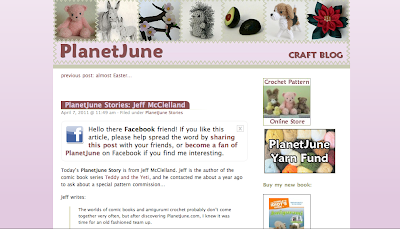 Plus, PlanetJune blog links! The second issue of the Washington, DC-area "Magic Bullet" is out and, presumably, being read by a thousand or so metro commuters (perhaps AT THIS VERY MOMENT). I managed to snag a handful of copies, so I can attest that they look just great. 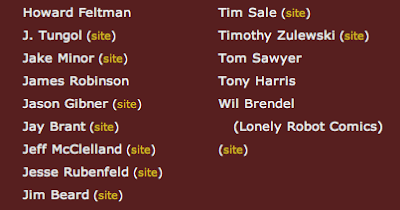 All of the entries have something to add and it's cool to see my work among those included. Rather than just hoard these copies in hopes that one day they appreciate in value so I can, I don't know, send someone to college (kids be damned), I'll be distributing them to comic stores in the Pittsburgh, PA and Wilmington, NC areas in the next few weeks, so if you're in either of those parts of the country, stop by and pick up the issue for zero dollars. There's currently a handy Google map with listings of where to find the publication, with most results coming from the Maryland/Virginia/DC area. You can find out more about DC Conspiracy's Magic Bullet at the very awesome MB website. Many thanks to everyone who made this a possibility. 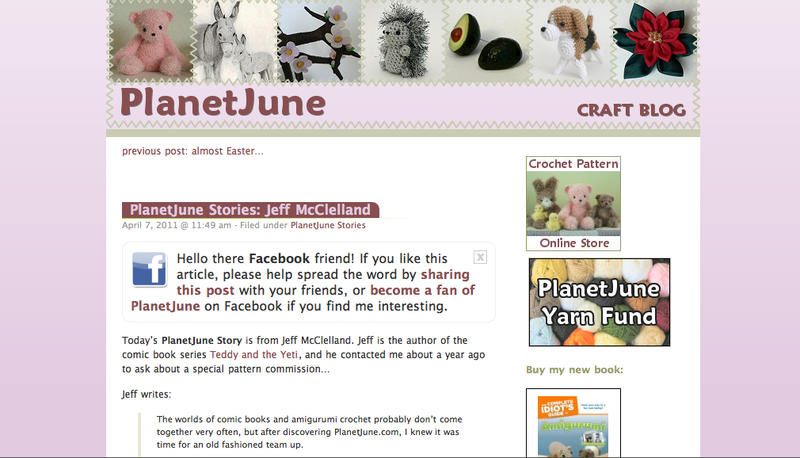 In addition to...whatever it is I just talked about, I recently had a review posted at the PlanetJune website regarding the crochet Yeti doll I commissioned last year. It posts some pictures of the Yeti doll and, well, me (and Lion-O) at last year's New York Comic Con. It turned out really well and I'll have more with me at this year's upcoming cons. Good stuff. Check it out! It's nice to do something different every once in a while, and I found that in lettering the above as part of a story submission, titled "One of the Good Ones". 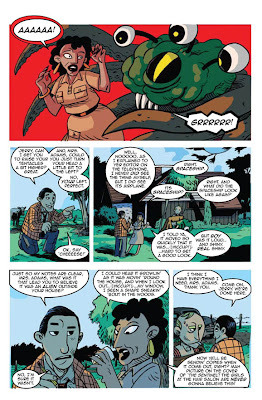 I met writer Sean Fahey on the Digital Webbing message boards and have been lettering his nine-page story for the past few days. I tend to letter a bit slowly, but I suppose that's the story of my life. I think it's turning out well, in any case. The story, written by Fahey, has art by Ben Passmore. I'm not sure when we'll hear back about this anthology submission, but I will put an update on here if it does get accepted. Fingers crossed! Either way, it's nice to have a change of pace and it's even nicer to meet some new creators. Best of luck to Sean and Ben with this story! My last post about Andromeda Jones, in the matter of two weeks, became the most-viewed post in this blog's entire history (take that, Pop Culture Connection!). While this is most certainly because my friend (and yours) Ruben Cordero put a link to it on his Twitter page, which was then re-tweeted by Todd Nauck, artist of the page I wrote about, I nonetheless feel that it is my duty to kowtow to the masses by showing more Andromeda Jones art. Some of this is ages old and some of it is newer, but almost all of it is going to be printed sooner rather than later. One of the things I like about Teddy and the Yeti is that it gives me the opportunity to print other short stories that otherwise don't have an outlet, and Andromeda Jones is the best example of this that I have. I printed the five-page "Message in a Bottle" story, with art by Ryan Stegman, in issue #1 because I had been sitting on it and trying to do something with it for what seemed like forever. And wouldn't you know it, I actually got mail that mentioned the story. 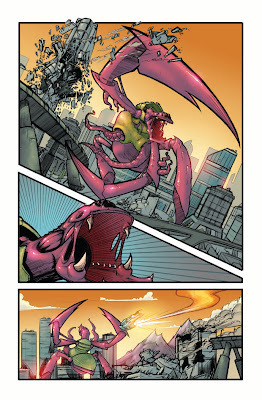 At the time, the Todd Nauck one-page story was the only usable sequential art that I had at my disposal, so to make it worthwhile for a future T&Y issue, I wrote another short story to appear with it - a three-page deal that artist Nick Acs and colorist Paul Little worked on. The first page for that story is at the top of this post, and I think it turned out well. I then went looking through my old files and found some other art that I had almost forgotten about, such as this pinup by Chris Whetzel. 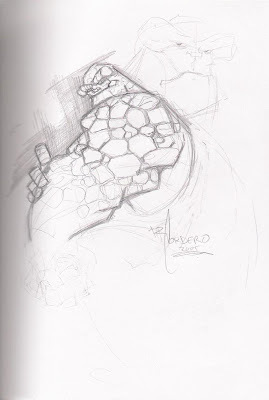 I'm currently having this inked and colored and I plan to use it as the back cover for the issue the two stories are printed in, just like how Teddy and the Yeti #2 had a back Mr. Massive cover (coincidentally by Todd Nauck). It should be noted that I've since changed the character's costume to make it a little less skimpy (or otherwise known as "just like every other female comic book character's costume", which I've tried to break away from), but hey, you work with what you have. It looks nice in any case. 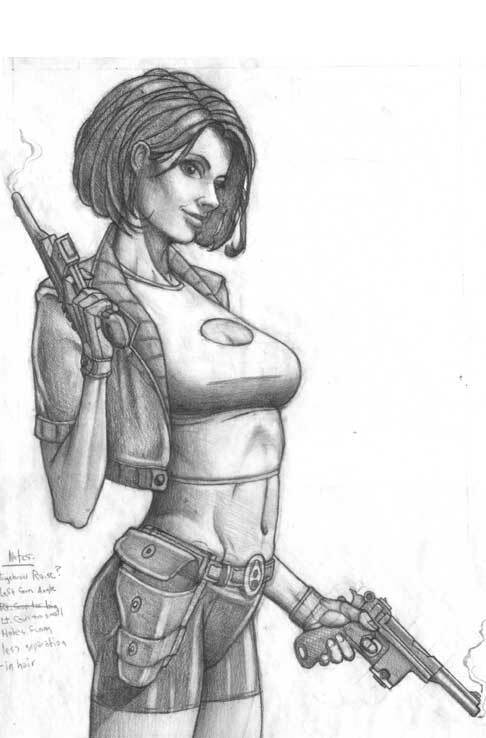 There are a few other pieces of art that I'm holding onto, such as the above pinup by Eric Pugh and the sketch below by Jeff Lafferty, but I don't have any hard and fast plans for either right now. The Todd Nauck story, the Nick Acs story and the Chris Whetzel back cover will probably show up in Teddy and the Yeti #5 or #6, wherever it works out best. It almost feels like spring cleaning, finally showing these things the light of day.